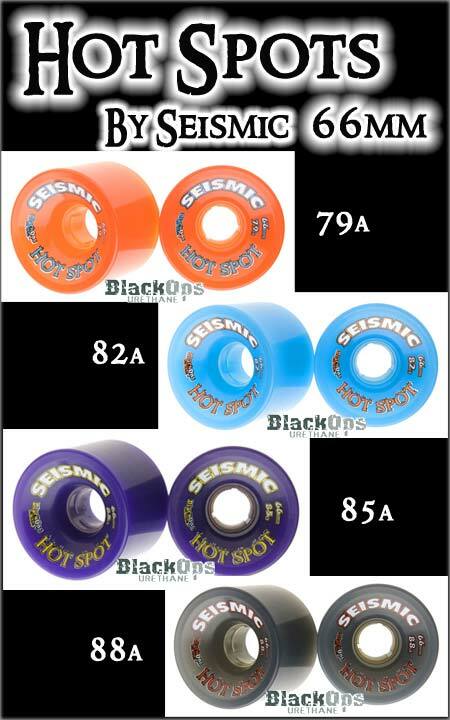 The popular Black Ops Hot Spot Wheel by Seismic in a sized down version of the original 69mm size. The Hot Spot design features a slightly squared lip that bevels inward at a small angle. It's a perfect complement to your race box and an outstanding choice for all-purpose longboarding, cruising and Old School styling. Specs: 66 mm tall; 49 mm wide in colors/durometers listed below. Sold in sets of two wheels. For highest performance, use a softer duro at the tail (where thrust is generated and grip is most critical) and a harder duro at the nose (to optimize roll speed). Black Ops Formula Hot Spots -- Choose from available duros when placing your order.